The Breathing Edge hardwood belt hanger is the ideal solution to closet belt storage. The compact design makes belts easy to access while consuming minimal closet space. The hanger fits securely onto any standard clothing rod and can store up to 18 belts per hanger of any length. A simple belt graphic makes the hanger rapidly identifiable and fits both classic and contemporary closet décor. The hanger maintains a consistent design motif with the entire hardwood belt hanger collection from The Breathing Edge and is designed to grow with your wardrobe. Each piece is artfully crafted to add an aesthetic touch while still being eminently pragmatic. 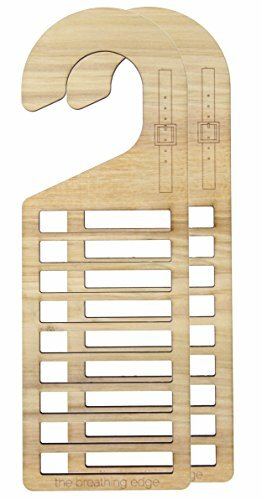 Made from high quality multilayered hardwood, the hanger is highly durable and will maintain its natural strength for years to come. All products made by The Breathing Edge are designed and manufactured in the United States. If you have any questions about this product by the breathing edge, contact us by completing and submitting the form below. If you are looking for a specif part number, please include it with your message.